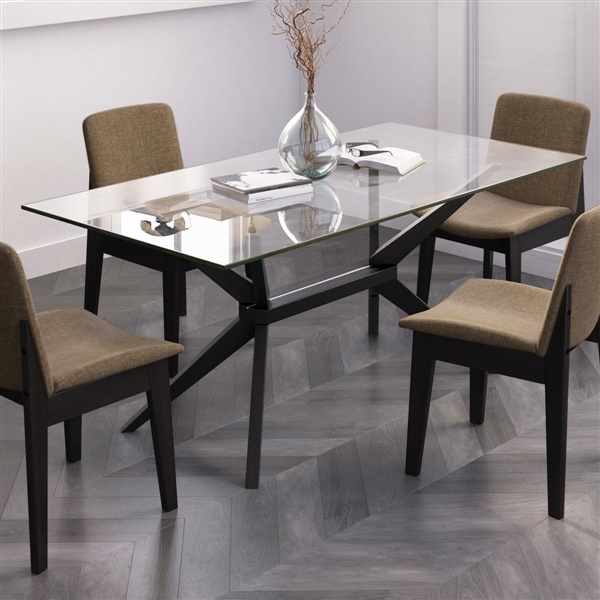 The Magna Glass Dining Table takes the idea of industrial chic, and lays on the glamour. It's done by adapting the basic shape of the girder to a clever support system for a modern dining table, then executing it in solid beech beneath a clear glass top that allows the geometry and construction details to show through. The rectangular dining table offers plenty of room for up to 6 people. The Magna Glass Dining Table's base is finished in your choice of color for striking geometry and contrast beneath the glass. Everything I order from this site is superb!! This table is no exception! Thanks a whole lot! STUNNING, HIGH QUALITY, LOOKS LOVELY!! Really impressed with the thickness of the glass and the quality of the overall design. The base is stronger and more supportive than I imagined. Beautiful table, happy to have! Pinch me I must be dreaming!! My table just arrived and it looks like it was MADE for my dining room - I don't even think getting this custom built by someone would come close to fitting the way it does in my home - a perfect match, couldn't even believe the price when i saw it - everything from top to bottom is incredible! Incredibly affordable and matches the chairs I ordered from here with perfection! My dining room redesign is shaping up VERY NICELY and I have inmod to thank!! Entire design is awesome on this table - loving the look of the legs! Thank you!! I fell in love with the base design of this dining table. It looks absolutely incredible in our dining room. We found the perfect chairs to go with it on the site too! Leg design of the table brings the chandler to the table, perfectly captivating mine and my husbands decor. This glass top is sturdy and looks perfect in my dining room. Clean up is easy. Love it! I plan to use a black finish chair with this table! is the darkest color you have still look brownish? The Coffee Finish that we offer on the Magna Glass Dining Table is a dark brown so it will definitely still appear to be brown.